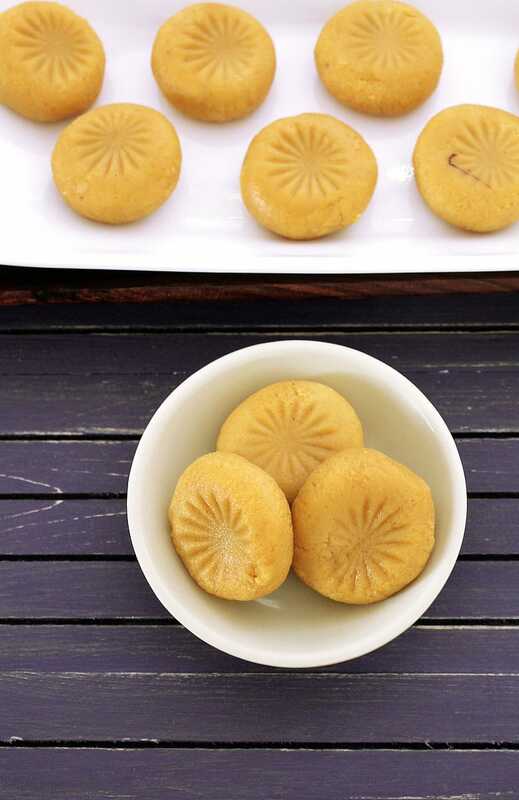 This is the instant version of making doodh peda recipe or Milk peda Recipe. You will need only 10 minutes and 3 ingredients only. 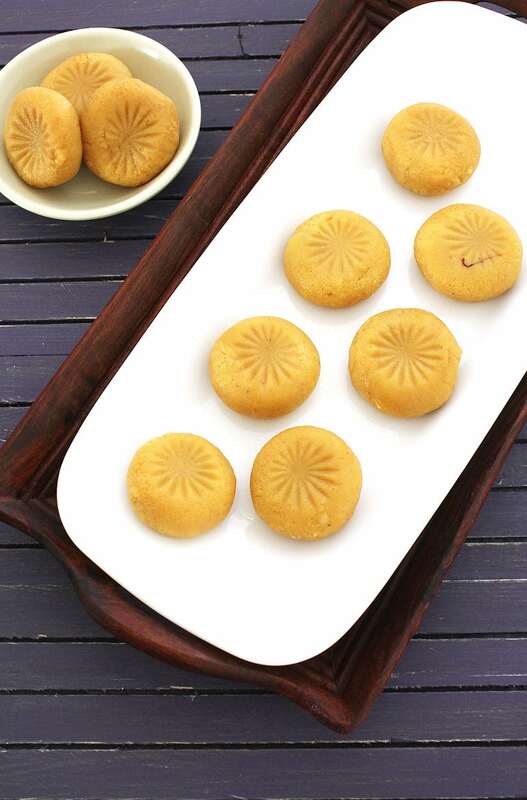 Peda is the popular and traditional sweet recipe from India. It is usually made from the khoya (mawa). I have already made the chocolate peda using khoya. But today, I am sharing the quick version which uses the sweetened condensed milk instead of khoya. For the flavoring, we also need saffron and cardamom powder. Please, please always use full fat milk powder. In USA, we get only nonfat milk powder in American grocery stores. 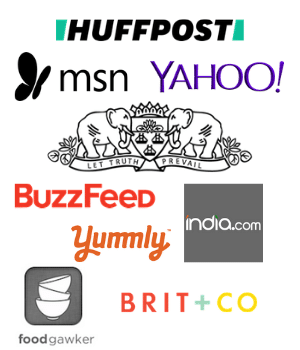 You will find full fat one in Indian grocery store. Many times it is labeled as mawa powder. 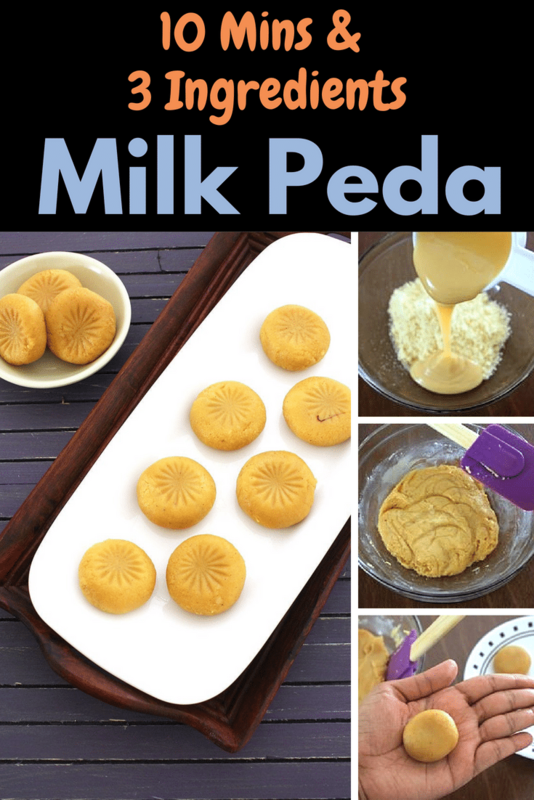 In the step by step photos of making milk peda recipe, I have used microwave. It takes only 3-4 minutes of cooking time. Then few minutes to let it cool down to touch and few minutes to shape them. So in total (from start to finish) you will need only 10 minutes to make peda. Do not want to make in microwave, I have also mentioned the stove top method as well. For your reference – my microwave has 1400 watt power. So adjust the cooking time as per your microwave power. 1) Take milk and saffron in small bowl. 2) Warm it up in the microwave for few seconds. Now rub it between the fingers, so it gets nice yellow color. Keep it aside till needed. 3) take butter in microwave safe bowl. 4) Melt it in the microwave. It may take only 5-10 seconds. 5) Now add milk powder. 6) Also add sweetened condensed milk. 7) Mix well using spatula till everything is mixed well. 8) Now microwave it for 1 minute. Remove it and stir. 9) Again microwave it for another 1 minute. 10) Now add saffron infused milk and cardamom powder. 12) Again cook for 1 minute. 13) Mix well and keep it aside to cool down. 14) It should be cooled to touch. grease your palm with little ghee and start shaping the peda. 15) Shape till all the mixture is finished and arrange them on the plate. 16) If using any peda stamp to make design on top then use that. Or you can garnish it with chopped almonds or pistachios. we are only two (I and hubby) at home, So i have made with only ½ of can of condensed milk. But you can double or triple the recipe as needed. if so you may need to adjust the cooking time. Storing the peda: It stays good for 3-4 days in airtight container in the fridge. Make sure to store in single layer in the container. If you are stacking them on top of each other, then make sure to line a parchment paper between them to avoid sticking. 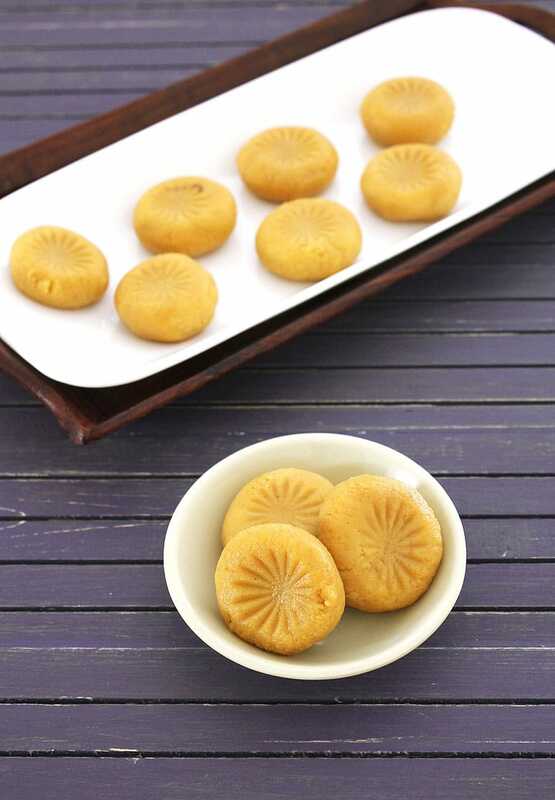 Serving suggestion: Peda are usually made or bought during festivals like diwali, raksha bandhan, holi and many more. It is offered to God during pooja and then distributed to devotees. When we are sharing any kind of good news (having a baby, passing the board exams) to our friends and family, we usually offer a box of peda as a gift. There are many other occasions when peda is the most used/eaten sweet. Mix all the ingredients except cardamom powder in a pan. All the ingredients means, melted butter, milk powder, condensed milk, saffron. Please use the nonstick pan. Cook this on medium heat for about 10-12 minutes or till the mixture starts to leave the sides of the pan. do stir continuously to avoid sticking to the pan. Remove it to a plate and let it cool to touch and then shape into peda. this instant version of milk peda or doodh peda is made in microwave and gets ready in 10 minutes only. Warm up the milk and saffron mixture in microwave for few seconds and then rub between finger and thumb. So saffron releases its flavor and color into the milk. Keep it aside. Melt the butter in a large bowl in microwave. Then add milk powder and condensed milk, mix well. Cook for 1 minute in microwave, stir well. Then add saffron milk and cardamom powder. Mix well. Lastly cook for another 1 minute, mix. Let it cool to touch and then shape into peda. Decorate with peda stamp or garnish with chopped almonds or pistachios. For your reference - my microwave has 1400 watt power. So adjust the cooking time as per your microwave power. Thanks for this wonderful easy recipe. Tried and pedal came out perfect. Can I use evaporated milk instead of condensed milk? If so, do I need sugar? What would be the proportions? You can use khoya and sugar like this chocolate peda.